Swap out the mayonnaise with a light Dijon vinaigrette dressing that gently soaks into tender red-skinned potatoes. This is perfect for taking on a picnic or serving at your July 4 barbecue. Summer is officially here and that means that it is time to fire up the grill and celebrate the July 4 holiday weekend. Where there are grilled burgers, barbecue sauce-laced chicken and ribs, there must be equally fabulous side dishes. 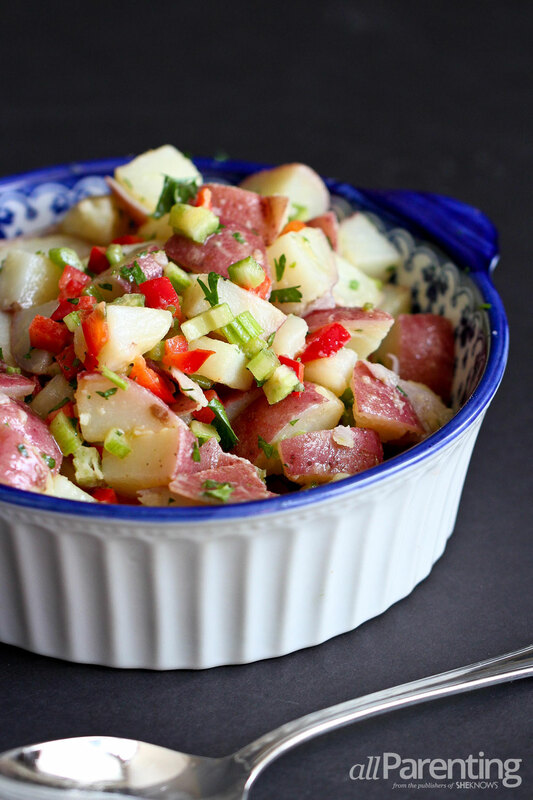 Potato salad usually makes it to the top of the "must-have" side dishes for any backyard barbecue. This summer, it is time to lighten up the classic recipe. In this lightened up recipe, there is not a teaspoon of mayonnaise to be found. Instead, tender red-skinned potatoes are tossed with a tangy Dijon mustard dressing. Diced red bell pepper and minced parsley add a burst of color and vitamins, and diced celery adds some crunch. This salad is easy to make ahead of time. 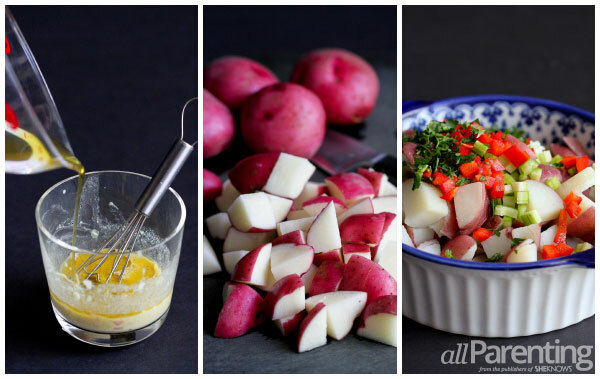 Boil the potatoes, dice the vegetables and whisk the dressing up to several hours before the barbecue. Before serving, toss everything together. In a medium bowl, whisk together the white wine vinegar, shallots, Dijon mustard, salt and pepper. While whisking, gradually pour in the olive oil until combined. Place the potatoes in a large pot and fill the pot with cold water so that it is 1 inch above the potatoes. Set over high heat and boil the potatoes for 20 to 25 minutes, or until they are just tender. When the potatoes cool to room temperature, add the red bell pepper and parsley, and gently stir in the dressing. Serve.